Girl Guides Australia seeks to promote friendship among the girls and women of all nations as a contribution to peace and understanding. an event, requested by either the World Association of Girl Guides and Girl Scouts or by the Asia-Pacific Region Committee, held in Australia and including members from other countries. Permission to hold an international event is obtained from the Board of Girl Guides Australia through the State International Manager and International Manager, Girl Guides Australia. For States wishing to invite members from other countries to a State event, refer to Invitations from Australia to other countries (as below). The International Manager for Girl Guides Australia is kept informed of all planning and progress. Permission to invite international guests is obtained from the International Manager, Girl Guides Australia, through the State International Manager. Invitations to other countries are sent only by the International Manager for Girl Guides Australia. Any invitation from another country for Guides from Australia to attend an overseas event must be referred to the International Manager for Girl Guides Australia. A WAGGGS International introduction card for members intending to travel overseas may be obtained from the State International Manager. A member intending to live overseas permanently or temporarily for more than 12 months may apply to the State International Manager for a transfer using an Overseas Transfer Form. This is arranged between the International Manager, Girl Guides Australia and the International Commissioner of the other country. Members representing Australia at overseas events must wear the correct uniform. Refer to the Uniform Booklet (July 2013)for specific requirements. Members to travel to and from official events in uniform. is willing to make the Guide Promise. She may be appointed as a Leader/Manager in accordance with State regulations. If she is a temporary resident, either the Australian uniform or that of her home country may be worn. Badges of both countries can be worn on either uniform. The World Badge may be worn as the promise badge. For the crediting of badges and certificates earned overseas, application should be made to the relevant authority in the State. A member who has made the Guide Promise prior to arrival in Australia makes a reaffirmation of that Guide Promise. She may then wear the Australian Promise badge. Refer to paragraph 1.3 Membership above. International appointments are made at Australian, State and in some cases, Region levels. Any Guide aged nine years or over may become a pen-friend of a member of the Movement in another country though an international scheme as known as Post Box. Individual Guides under nine years may have interstate pen-friends. Any unit may have links with other units. All arrangements are made through the National Post Box Secretary – click here for more information. Any member of Girl Guides Australia placing Guide related information on internet website must adhere to the Internet and Social Media Policies of Girl Guides Australia as detailed in Policies. 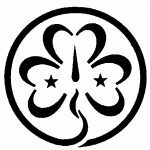 World Association of Girl Guides and Girl Scouts Constitution Article IV. Girl Guides Australia is a foundation member of the World Association of Girl Guides and Girl Scouts which was formed in 1928. Girl Guides Australia subscribes to the policy and conditions of membership of the World Association and pays an annual quota. Delegates of Girl Guides Australia attend World Conferences as fully participating members. The joint birthday of the Founder Lord Robert Baden-Powell and the World Chief Guide Lady Olave Baden-Powell is 22 February. This is known as World Thinking Day by members of the World Association of Girl Guides and Girl Scouts and Founder’s Day by the World Organisation of the Scout Movement (WOSM). The Thinking Day Fund, administered by the World Association of Girl Guides and Girl Scouts, is supported by voluntary contributions collected on World Thinking Day. It is used to help establish and extend Guiding around the world. The Good Turn symbolises the service given by all members of the Movement to the community. A Good Turn is a service given voluntarily by one or more Guides without expectation of acknowledgement or reward. Younger Guides think of ways in which they can do a Good Turn every day. Older Guides and adult members develop this further into service projects at a local, national and international levels. 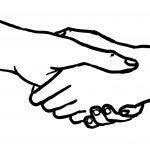 The left Handshake was introduced by the Founder as a means of easily recognising other members of the movement. The Motto, Be Prepared, shares the Founder’s initials and is a practical reminder of the educational purposes of Girl Guiding and Girl Scouting. In giving the Sign Guides and Girl Scouts raise three fingers of the right hand as a reminder of the original three-fold promise. The three leaves represent the three-fold Promise as originally laid down by the Founder. The flame represents the flame of the love of humanity. The vein pointing upwards represents the compass needle pointing the way. The two stars represent the Promise and the Law. The outer circle represents our worldwide Association. The golden yellow trefoil represents the sun shining over the children of the world. The World Badge is the World Trefoil on a bright blue background. It may be worn by all members who have made the Guide Promise. It may be worn in or out of uniform. The World Flag consists of the World Trefoil in the upper left-hand corner on a bright blue background. The white blaze in the lower right-hand corner represents the commitment of the World Association to peace. This is crowned by three golden squares symbolising the three-fold promise. The World Song was adopted at the 13th World Conference in 1950. The music was adapted with the approval of the Finnish composer, Jean Sibelius, from his March Opus 91b. It was originally composed as the march for one of Finland’s oldest Scout companies. First published with English words by Gavin Ewart in 1952, the World Song highlights the principles and spirit of the Movement. Regional groupings have been established within the framework of the World Association. These groupings are Africa, Arab, Asia-Pacific, Europe and Western Hemisphere. Australia is a member of the Asia-Pacific Region which was formed in 1969.